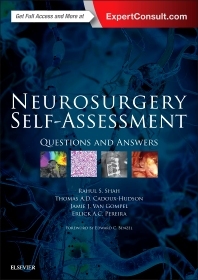 Ideal for both neurosurgical residents and recertifying neurosurgeons, Neurosurgery Self-Assessment: Questions and Answers offers the most comprehensive, up to date coverage available. Over 1,000 clinically relevant multiple-choice questions across 46 topic areas test the candidate’s knowledge of basic neuroscience and neurosurgical subspecialties to an unparalleled degree and provide detailed answer explanations to facilitate learning and assessment. Over 700 histology, pathology, radiology, clinical and anatomical images serve as an index of routinely tested-on images in neurosurgical examinations with high-yield summaries of each pathology to reinforce and simplify key concepts. Includes only multiple choice questions in both single-best-answer and extended matching item (10-20 options) format increasingly adopted by neurosurgery certification boards worldwide. Questions are organized by topic and classified by degree of difficulty through a highly visual "traffic light system" which codes each question in green, amber, or red. Includes coverage of the landmark studies in areas such as vascular, stroke, spine and neurooncology. Practical tips facilitate study with test-taking strategies and things to consider before sitting for an exam. Utilizes Imperial and SI units throughout. Expert Consult eBook version included with purchase. This enhanced eBook experience acts an interactive question bank which automatically scores and provides immediate answer feedback, as well as allowing you to search all of the text, figures, and references from the book.